Maurizio Sarri has tasted the Premier league and has discovered that not having a plan B is very costly as teams can easily figure you out. He has therefore decided to undertake a new approach to ensure that the team is more flexible and unpredictable with his winter target key to this change. The arrival of Gonzalo Higuain with Elseid Hysaj arrival in the pipeline is meant to give a voice to this new look team planned by the Italian. Yes, Higuain will of course give teams something to think about as this is his maiden appearance in the premiership. The Argentine is powerful, technically sound and knows how to lead the lines. Alvaro Morata is close to joining Atletico Madrid after failing to live up to the big money move that brought him to England. His performances have been so underwhelming that he had to jettison the number nine shirt for something bigger believing that the number was his undoing but alas nothing has changed. Also, the coach has decided to stay the decision to bring Cesc Fabregas replacement as the players targeted have moved to other clubs or remain with their current ones. 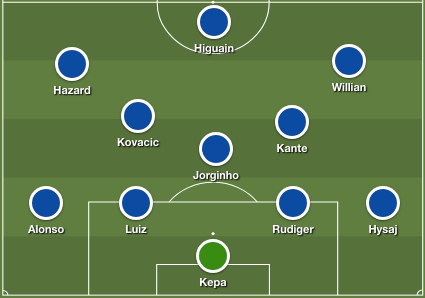 The midfield doesn’t honestly need immediate overhaul given that about five players are competing for three available spots occupied by Jorginho, Mateo Kovacic and Ngolo Kante with Ross Barkley, Reuben Loftus-Cheek as cover. The right back has been a position the boss has wanted to upgrade with consistent Cezar Azpilicueta showing unusual occasional lapses this season. Elseid Hysaj who worked under Sarri while in Empoli has been tipped to replace the Spaniard in this window or the next. If these players are brought in, Chelsea will fare differently as the team will have a go to striker and a trusted defence with Elseid Hysaj involved.